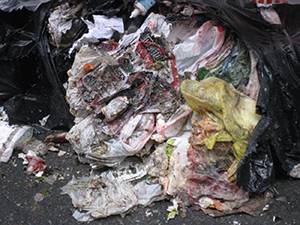 Plastic products and organic residues, shown here mixed in a bag of trash, make up over 50% of all disposed urban wastes and pose serious risks to people and ecosystems at a variety of scales. Photo by Samantha MacBride. The Peabody Museum of Archaeology and Ethnology at Harvard presents the free lecture, “Products, Plastics, Putrefaction, and Power: Rethinking How We Manage Materials to Achieve Just Sustainability,” on Thursday December 1, 2011 at 5:30 P.M. at the Geological Lecture Hall (24 Oxford St., Cambridge). The free lecture will be followed by a public reception at the Peabody Museum (11 Divinity Ave.). The majority of urban trash is plastic or biodegradable. What is the best way to manage these materials? Businesses and environmentalists are battling it out right now. We tend to think about “trash” as all one thing, but trash is composed of sets of materials whose molecular properties, economic status, and cultural meaning are quite distinct. This illustrated talk examines two sets of materials in trash – (1) the wide variety of products known as “plastics” and (2) biodegradables: including food scraps, yard trimmings, and other things that rot. Coalitions of businesses see a profitable future converting plastics and organics into chemicals and energy. But environmental movements argue to phase out plastics and compost biodegradables. The rift in policy attention, business approach, and social imagination between the two opposing viewpoints is great, and sheds light on how society grapples with materials we discard, and how we might manage materials in a more a more just and sustainable way in the future. The speaker is Samantha MacBride, Adjunct Assistant Professor of International and Public Affairs, Columbia University School of International and Public Affairs. This entry was posted in Environment, Labor, Sanitation, Waste. Bookmark the permalink.